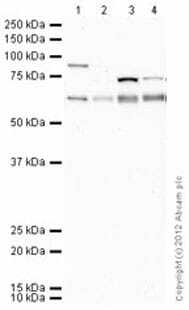 Mouse monoclonal AMPK alpha 1 + AMPK alpha 2 antibody [34.2]. Validated in WB, IP, ELISA, IHC and tested in Mouse, Rat, Human, Drosophila melanogaster. Cited in 24 publication(s). Publishing research using ab80039? Please let us know so that we can cite the reference in this datasheet. ab80039 has been referenced in 24 publications.